Paypal has introduced a mobile credit card reader enabling on-the-fly transactions at small firms worldwide. "Paypal Here" consists of a blue triangular reader which plugs into a smartphone's audio jack and an app to control it. The announcement by eBay's online payments unit marks an aggressive move into the mobile payment space. It puts the business in direct competition with other providers including Square and Google Wallet. The three solutions offer an alternative to installing a more complex cash register system. 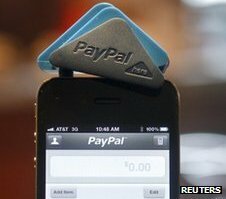 Paypal launched its product at a San Francisco event saying that it was designed to make the traditional "payment experience disappear". "It's designed to help... merchants make more sales and grow their business with confidence," the company stated in a blog post. For now, the free reader works only on iPhones, but an Android app is planned to start next month. Over the past 14 years, Paypal has helped make encrypted online payments part of mainstream commerce. It has about 100 million customers worldwide using 25 different currencies. That sort of entrenchment gives the firm an edge as it attempts to extend its reach. 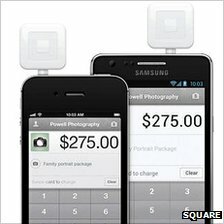 But it faces a challenge from Square. The two-year-old mobile payment start-up was founded by Twitter's creator Jack Dorsey. The All Things D tech site recently reported that Square nowhandled $4bn (£2.5bn) worth of transactions a year with its small, cube-shaped card reader which works on smartphones and tablets. It is currently only in the US but it has said that it is "beginning to look into other markets". Google Wallet takes another approach: consumers' credit card information is stored in the cloud. Smartphones equipped with the credit card data can be swiped at participating shops. But to date, its appeal has been limited since it only works in the US with Samsung's Nexus S 4G smartphone and is restricted to the Sprint network and 140,000 locations. Unlike its key competitors, Paypal Here accepts most major credit and debit cards. A built-in scanning feature also uses a smartphone camera for payments made by cheque - although initially this feature will be limited to the US. The system is initially being shipped to a few thousand merchants, first in the United States, along with Hong Kong, Canada, and Australia. The firm said that rollouts to Europe and additional countries would be added in weeks and months to come. San Francisco-based Kara's Cupcakes was one of the first businesses to try out Paypal's new device. After a few hours, store owner Kara Haspel Lind appeared satisfied that it was easy to use and offered secure "instant transactions". She said she could envisage it helping speed up sales to customers. Paypal charges a 2.7% cut for each credit card swiped, slightly undercutting Square's 2.75% rate. The fee rises if the card's details are entered manually.